Today marks the first of the presidential debates between Hillary Clinton and Donald Trump. To help you have fun with the constant mind numbing rhetoric, Blue Loop LCC will release a special election edition of their popular word game Instant Regret on Sept. 27. 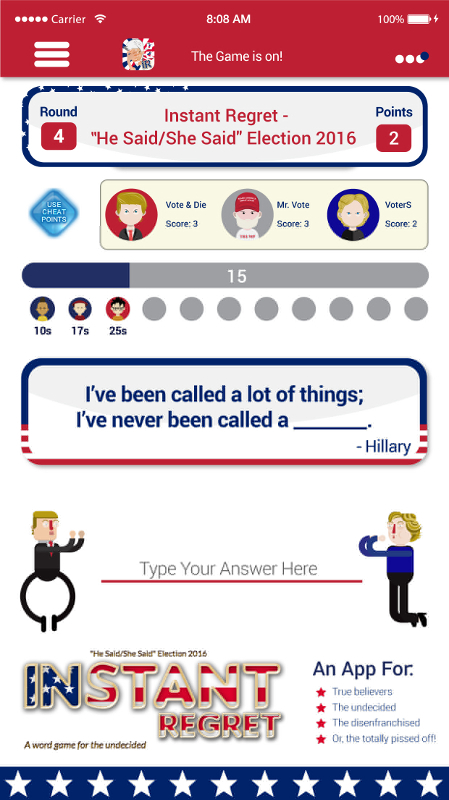 Instant Regret “He said/She said” Election 2016, a free in the Apple App Store, lets friends and strangers compete to see who can complete a sentence in the wittiest way possible, according to a press release. Players can expect to see classic phrases like, “I’m in good health; I just have a slight ______. -Clinton” or, “The change will start right away, the moment I ________. -Trump”. The game can accommodate 4 to 11 players. Fill in the blank and one of the other players will judge the best answer, and a new judge is selected each round. The first player to get seven points wins the game. The press release stated players can invite their friends to play by email, SMS or Facebook Messanger. Players can earn extra points by sharing completed sentences to Facebook or Twitter. They can also check most liked answers through the leader board.